Equalseal.com’s EPDM 61 is a smooth finish, 75 Durometer, sulfur cured EPDM rubber sheet. 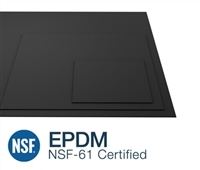 EPDM has been tested and certified to meet the qualifications of NSF 61 for use in products that come in contact with potable water. Available in 1/16”, 1/8”, ¼”, and ½” thick, and 48” wide. EPDM NSF 61 Black 75 Duro - 1/8" Thick - 12" x 12"
EPDM NSF 61 Black 75 Duro - 1/4" Thick - 12" x 12"
EPDM NSF 61 Black 75 Duro - 1/2" Thick - 12" x 12"
EPDM NSF 61 Black 75 Duro - 1/8" Thick - 24" x 24"
EPDM NSF 61 Black 75 Duro - 1/4" Thick - 24" x 24"
EPDM NSF 61 Black 75 Duro - 1/2" Thick - 24" x 24"